Okay, back to the sand castles. It's a whole weekend festival with a parade and street music and a couple of sound stages and vendors and a pancake breakfast on the beach and fireworks. Seacoast Drive is closed to traffic. There's an Annual Kids 'N Kastles competition for youngsters 12 and under. This past summer (July 14-18), the competition behind the competition was the big battle between a local team (Team I.B. Posse) and an Orange County team (Team Archisand). Ooooh. Team Archisand had taken first place six out of the last eight years. 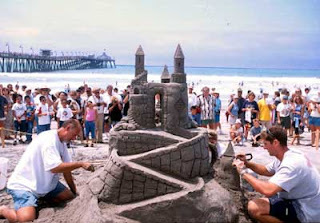 The building takes place on Imperial Beach near Seacoast Drive and the pier. Spectator tickets are free. Parking is tough. But for a donation to the football team, you can park at Mar Vista High School on Coronado Avenue near Fifth Street. Oh, I forgot to mention that there are cash prizes. So, you could go play with a trowel and plastic straws and makeup brushes in your kid's sandbox. A win could pay for your trip out here. Now, you should all trot off to Travis Erwin, the guy who spearheads My Town Mondays. He'll have a list of links to other Mondayers. 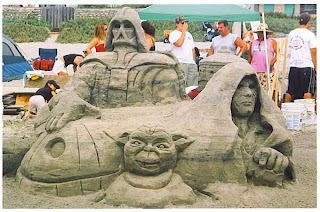 I'm leaving you with a shot of an amazing sand sculpture. If you've got a sec, come see me over at the Class of 2k8's blog. 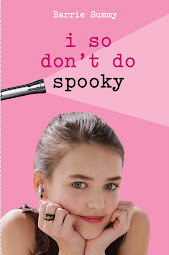 There's a mini-mini-mini-interview about I So Don't Do Spooky (Book #2)! I swear, it's short. But cute. The Way I Was is one of the best books I read this summer. It takes place in 1962 when a 16 year old boy (whose name you only discover near the end of the story) is dropped off at a third-rate boarding school in East Anglia, England. He meets another adolescent, Finn, who lives completely alone in a hut by the sea. Our hero winds up leading a double life where he's sneaking off to meet up with Finn and awkardly learning about himself and life (not sexual). From the flap: The two become friends, the boy risking scandalous rumour and expulsion from school. But they can't hide forever. 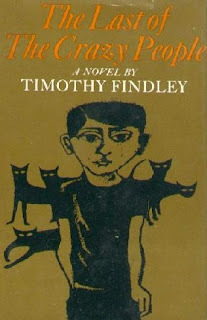 Disaster invades from all sides, and the boy discovers that nothing has been what he believed. There's a wonderful and huge plot twist about 3/4 of the way in. A twist which totally knocked me for a loop. One review I read called the twist predictable. But, uh, not for me. This is a link to that review, but be careful as there are lots of spoilers. In her own life, Meg has known difficult and vulnerable times. She's one of four sisters. Three of them have had cancer. At only 39, her youngest sister died from it. Meg was in hospital with the disease when her first book, How I Live Now, was released (2004). Here's how Meg described her mindset: Every day a piano doesn't fall on my head is good luck. So I am terribly worried now because things seem to be going awfully well. I spend a lot of time planning my funeral. Here's the link to Meg's website. I have already ordered How I Live Now and Just In Case. I do love that feeling. When I know I have a couple of really good books waiting in the future for me. The Ronald J. Norick Downtown Library in Oklahoma City is one of the coolest library you'll ever step foot in. In general, I'm partial to old libraries with heavy oak bannisters and high ceilings and mysterious lighting. This library is an exception. It's a four-story, 112,000-square-foot white, gleaming library and learning center named for former Mayor Ronald J. Norick. As part of the opening ceremonies, staff and supporters passed books BY HAND from the old to the new library. Mayor Ron's dad (James Norick) was also mayor of OKC, once upon a time. The stacks and other library services are located on the first two floors. There's a business information center and small meeting rooms on the third floor. On the fourth floor, there's a conference center and auditorium. WERE EACH INTERVIEWED FOR TV!!! Sorry, I had to shout this out. BJ Williams is the producer of Read About It. She and Doug Benton do the interviews. They interview 48 authors each year. 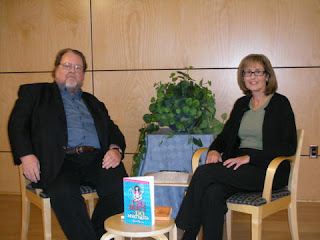 Doug Benton and me just before the start of the interview. He'd read the Advance Reader Copy of I So Don't Do Mysteries and prepared enough questions to fill up our 8 minutes. Gulp. Deep breath. Sorry to report that I don't think I gave that great an interview. Sad but true. It's like I just couldn't relax or something. It all felt too weird. It wasn't the people; they were super nice. There was BJ Williams and Doug Benton, the inteviewers I already mentioned; Jon and John, the camera guys; and Lesli the makeup person. I don't really know what my problem was. I mean, I'm generally a pretty chatty Cathy. The cameras, the having to look in a certain direction, the little coffee table that didn't actually live anywhere? I don't know. And guess what was in the back of mind for the entire 8 minutes (which is actually an eternity when you're ill at ease)? I hope I don't cough. Because a cough would've been so loud with the mic attached near the collar of my sweater. Well, the second I thought about not coughing, I got a tickle in my throat. Anyway, it's a done deal. I guess I'll know more after I see the DVD. The show only airs in the metro Oklahoma City area. On the upside, if I ever do something like this again, I think I'll be better at at. On the upperside, I did learn about a couple of great makeup products from Lesli. Which I'll gladly share: Eye Bright by Benefit is whitish eyestick which, when applied to the inside corner of your eye, totally opens the sucker up. You immediately look bright-eyed and alert. Then there's Sally Hansen's Skin Firming Line Minimizing Liquid Powder makeup. Leslie used "beach" on me. This product obliterates the circles under your eyes. Obliterates. With these two products, you could pull an all-nighter and look none the worse for the wear and tear. Please visit Travis Erwin, the guy who spearheads My Town Mondays. He'll have a list of links to other Mondayers. I bet everyone, unlike me, got their posts up in a timely fashion. In the last two days, I've met FIVE of my classmates from the Class of 2k8! Life is very excellent. WEDNESDAY: Oklahoma roadtrip with PJ Hoover, debut middle grade author of The Emerald Tablet. Also along for the ride is Child #4 (who's escaping from a house with a throwing-up cousin to hang out with authors and an author's kids). What can I tell you about PJ? High energy. Helpful. Entertaining. The type of girlfriend you def invite to your slumber party because she'll keep it all lively. 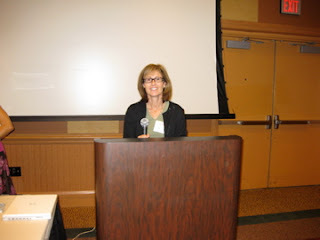 We stay with Stacy Nyikos, hostess extraordinaire and debut middle grade author of Dragon Wishes. She is ultra generous. With her exquisite guac. And her strawberry margaritas that defy description. And her oodles of info on school visits and public speaking. And her incredible organizational skills. Thank you, Stacy. 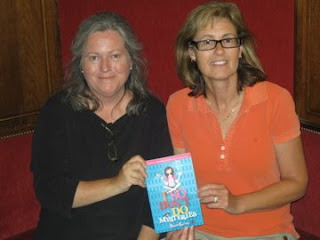 Jenny Meyerhoff, debut middle grade author of Third Grade Baby, flies in to chill with us. Jenny is sincere and thoughtful. She makes you think. I'm guessing if you have Jenny as a friend, you have a friend for life. Plus, she has stupendous black leather boots. THURSDAY: Jenny, PJ, Stacy and yours truly do a panel at Encyclo-Media, the annual librarian-educator event in Oklahoma City. Are you sitting down? Take a look at the next photo. THERE WERE ONE HUNDRED FIFTY (150!!!) 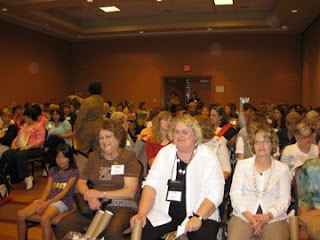 PEOPLE AT OUR PANEL! That is THREE HUNDRED eyeballs. Luckily, this was an extremely nice and welcoming mob who loved all four of us. I bet they ask us back next year. I couldn't help but notice this crowd had a sophisticated sense of humor. They laughed at all my jokes. AND seemed genuinely interested in meeting Sherry come December 9th. Does my heart look like it's hammering a million beats a minute like I'm on the elliptical at the gym? 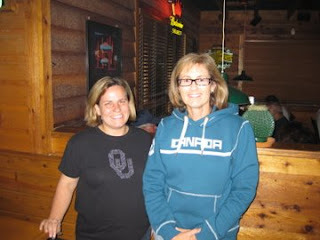 I met up with the amazingly creative Brooke Taylor, author of Undone, and another member from the Class of 2k8. There are many many things I liked about Brooke. She's witty, fun, smart, loves to talk books, drinks diet coke AND she's way shorter than me. It's not often I tower over someone, and I enjoyed the experience. Yes, yes, I insisted we stand up for the picture. Just messing with you, Brooke. I LOVED having dinner together. This My Town Monday post comes to you all the way from rural Oklahoma where Child #4 and I are hanging with DH's side of the family. Then, on Thursday, I'll be on a panel with four other Class of 2k8ers at EncycloMedia in Oklahoma City ("the City" as they say here). Yikes! So not thinking about that right now. So not getting nervous yet. Anyway, today I visited Mark, one of DH's best buds from high school. From waaay back when. 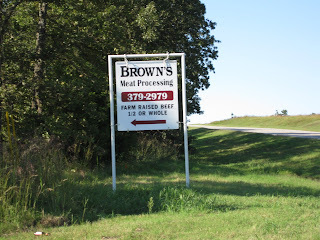 And this friend and his wife have their very own meat processing business, out here in the country off Highway 270. 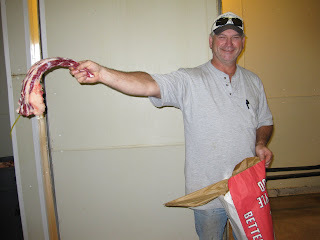 This is Mark, holding up a steer's tail, which, when boiled, makes great oxtail soup. Mondays and Thursdays are killing days. 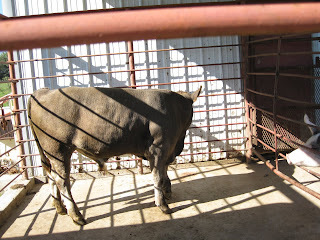 I took this photo of a bull yesterday, on Sunday. You can do the math from there. WEIRD TRIVIA: If you're ever planning to have a bull butchered, make sure it happens before he hooks up with a heifer or...the meat will taste funky. Either that or have your bull castrated at birth. 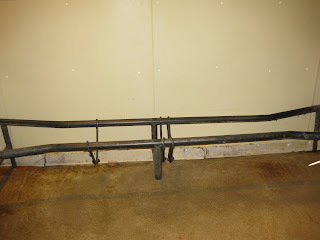 Then the animal us unhooked and laid out on this rack for skinning. 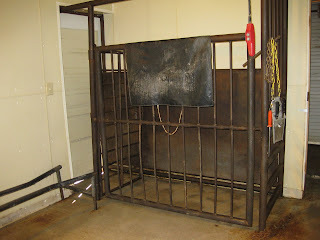 Then, it's back up on the hooks to finish the skinning and take out the insides. The meat cures in the freezer for a couple of weeks. 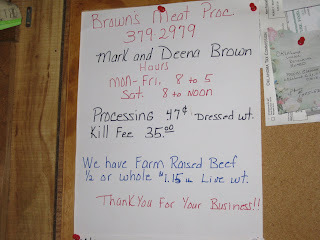 The meat is cut into steaks, roasts and ground. 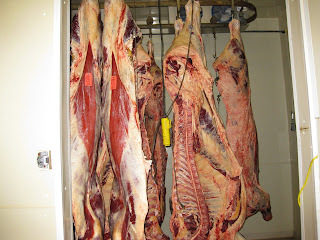 A steer (a castrated bull) with a live weight of 1200 pounds dresses out to a bunch of meat packets weighiing about 700 pounds. WEIRD TRIVIA: What we call tri tip in California, they call brisket here. 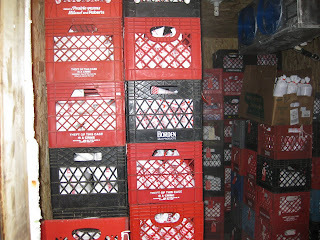 Here's a bunch of packaged meat in a freezer, waiting to be picked up. I know there's a gross element to all this, but, honestly, even as a totally citified girl, I found this entire visit fascinating. And not just because I'm a sucker for weird trivia. No, it's because this guy figured out what was missing in his community, filled the void and is making a pretty decent living at it. And isn't that what it's all about? Finding out where you fit in in life? I am guilty of negligent blogging. I was going through some (there are thousands!) of the pics on my computer. 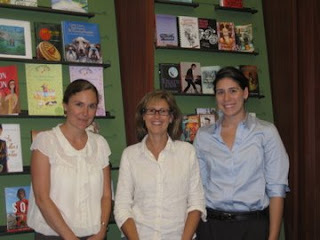 And I came across this lovely shot taken when I visited Random House in Canada's Mississauga office. I had the pleasure of chatting with Julie Forrest, Random House in Canada's Super Smart Plugged In Online Guru. Okay, her title might really be Online Marketing Coordinator. At any rate, she is super smart, knows megabytes about the internet and blogging and books and writing and authors. And probably lots of other topics that we just never made it to. We were joined by the brilliant and delightful Jessica Scott, another Random House techie wizard. 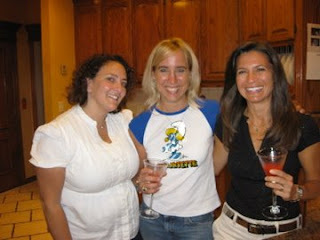 Julie and Jessica offered me all kinds of solid suggestions about blogging and other social networks. Suggestions I really will take. Slowly but surely. Both Julie and Jessica were really easy schmeasy and interesting to talk with. It was very fun finding out which blogs we all read and learning of new blogs to try out. I was having such a good time that I didn't want to leave. They practically had to throw me out. Here's a blog you'll want to check out. It's Random House Insiders Blog. A variety of bloggers post here, including Julie herself. And they have authors guest blog from time to time. Yes, yes, yes! You guessed it! I'll be guest blogging there one of these days! 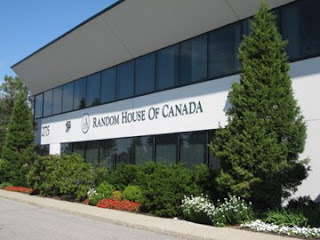 Here's what Random House in Canada, Mississauga office looks like from the outside. 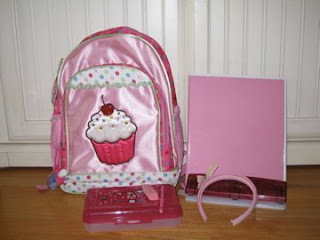 In other negligent blogging...I totally forgot to link to the Class of 2k8. Hop on over to see what Nancy has to say about herself and her debut novel, Samantha Hansen Has Rocks in Her Head. For every different person who leaves a comment on one of Nancy's launch posts, she'll donate $1.00 to the National Park Foundation. It's a worthy cause. How's this for fun synchronicity? 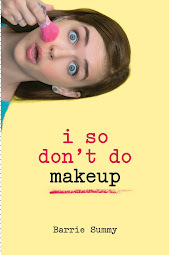 I sent back the copy-edits for I So Don't Do Spooky (book #2). They arrived at Random House yesterday, Sept. 9, which is exactly three months before the release of I So Don't Do Mysteries (book #1)!!! Okay, fine, it looked more interesting before I typed it. In other news--tonight I attended Open House at Child #2's high school. Can I just say that I LOVE Open House at the high school. LOVE it. I don't know why. I didn't particularly enjoy high school the first time around. But there's something about English reading lists and those little desks with the chairs attached and overhead projectors. It takes me back to a time when the future stretched out for miles. I went from class to class, listening to the teachers, reading the class requirements, chatting with other parents. And I thought to myself, I'd be so so good at high school now. Then I went to Algebra II. Yikes. I am so glad to be done with high school. In yet other news-- DH, not Child #4 (who is exhausted with her return to school), chose the winner for the exotic Canadian foods contest. And the winner is (drum roll)... Linda of Flights a Fancy!! Linda, please have your people email my people at barrie.summy@gmail.com. AND I'll toss a few of the cutest most adorable bookmarks in your package. I've never met a curry or a lentil or a samosa I didn't like. Plus, I love to meander and window shop and people watch. 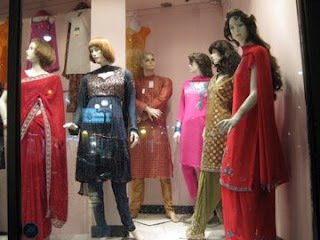 So, while in Toronto, I was thrilled to squeeze in an evening with the sisters, wandering around Little India. 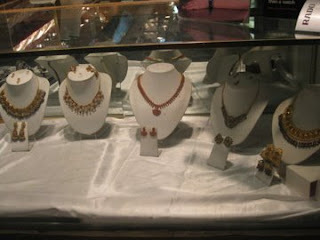 Little India is found along Gerrard Street East, where it stretches for about nine city blocks. Strolling along, it's hard to believe you're still in a big North American city. There's a variety of shops, mostly catering to Indian culture. For example, you can buy all sorts of Indian wares from pots and pans to incense to books to groceries to clothing to music to very fresh spices. And there's a plethora of Indian restaurants. 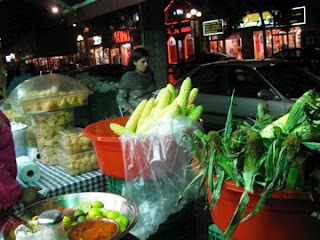 I'm sorry to report I didn't get any decent street shots (it was bucketing and dark), but here's a pic of a vendor selling various snacks for noshing as you walk, including roasted corn, a very popular item. And this is where we ended up, my two sisters and I. 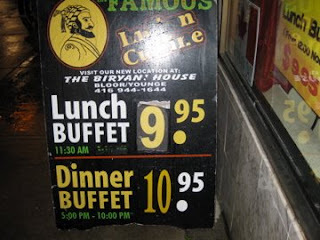 We had a delicious and, as you can see, inexpensive Indian buffet. Actually, this is a pretty typical price. We were a little disappointed that goat meat wasn't available. Still, we had a delightful time, chatting and solving the world's problems and eating far far too much. And a little extra trivia: Toronto is a Mohawk word meaning "meeting place." T.O. (for short) is home to more than 80 ethnic groups. That diversity is one of the things I miss about living down here in Southern California. I also miss my ketchup potato chips. And I can't believe how very polite you've all been and not mentioned how I forgot to have Child #4 choose a winner for that particular contest. Oh, or maybe it's that nobody really wants ketchup potato chips! Seriously, you don't know what you're missing! At any rate, we'll take care of this oversight tomorrow. 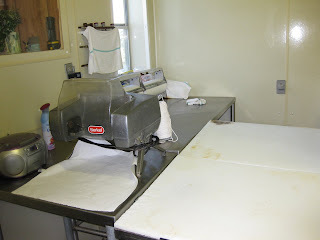 I will be out of town for next week's My Town Monday's post. I think I'll do my post from that mystery location. You'll have to check back to find out where I am. Ooooooh. My Town Monday is hosted by Travis Erwin. Check out his very interesting post this week on Amarillo, TX and helium. Also, he'll have a list of the other participants. You may or may not know that I was recently in Toronto. Of course, you know! I was there for FOUR WHOLE WEEKS and blasted you with blogs and My Town Mondays from there. 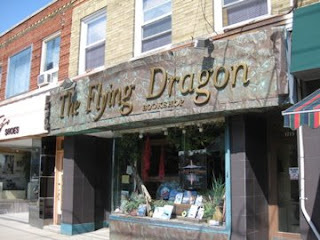 Anyway, while in Toronto, I visited The Flying Dragon Bookshop, located on Bayview near Eglinton. I realize that tossing off the street names means little to most of you reading this blog. BUT, as someone who is SEVERELY directionally challenged, I'm thrilled that I can actually remember this detail! The Flying Dragon is this really amazing independent bookstore with a great kids' section. And, well, a great adult section too. And, well a great...Actually, it's an all round great bookstore. Besides the wonderful selection of books, here's an interesting tidbit: The Flying Dragon puts together themed book baskets. A COMPLETELY RANDOM example: if you wanted a mystery book basket, they might include a copy of I So Don't Do Mysteries. Ha! Anyway, themed book baskets. What a novel (pun intended!) idea! Back to the story. I stop in at The Flying Dragon Bookshop to meet Cathy Francis, the proprietor, and to drop off an ARC (Advance Reader Copy) and some bookmarks. So, I'm chatting with Cathy (who is very friendly and fun and knowledgeable). We're talking about blogging and online stuff and I pull out the Class of 2k8's very cute brochure. The convo goes more or less like this. "Oh, I know about the Class of 2k8," Cathy says. "Wow. That's great," I say. "How?" "One of my Saturday employees is a blogger and she told all of us here about you guys." Oh my gosh!!! So, Shelf Elf, a terrific kidlit blogger, works Saturdays at The Flying Dragon Bookshop! I squeal (professionally, of course! ), then race back to my car to grab an ARC for Shelf Elf. And guess what? Shelf Elf read the ARC right away. And posted a lovely lovely review. 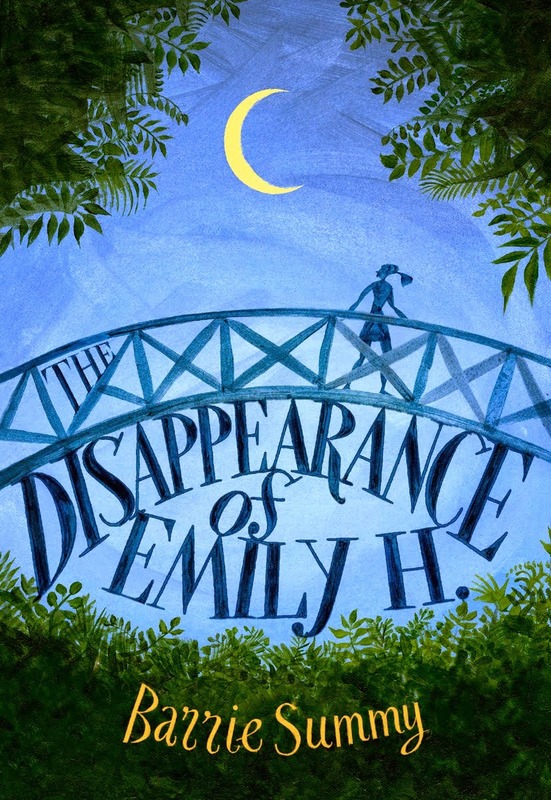 To recap: I wander into a bookstore in Toronto, learn that a kidlit blogger works there on the weekends, leave said blogger a surprise ARC and, voila, a book review! That, my dear blogging friends, is why I say the world is one big shrinky dink. Who knows when or where or how we'll meet up with each other.